One of the more maddening parts of covering and discussing the mass transit system in Los Angeles is a fare structure that, quite honestly, doesn’t make a lot of sense. Fares vary wildly depending on whether one is riding Metro or a local system. Transfers are rare among agencies, and difficult for new riders to figure out on Metro. If you have to transfer between buses, it can cost you more to go a mile with a couple of transfers than it would to go from North Hollywood to Long Beach via train. And let’s agree to not even talk about places such as Santa Monica Boulevard, where short line service will force a transfer, and a new fare, even if you’re traveling in a straight line. “The current system is not equitable,” commented Transit Coalition Executive Director Bart Reed in a phone interview. So, Metro is trying to create an equitable fare system that also raises more money for the agency. The Metro Board of Directors has a history of avoiding fare increases. “Fare Hike” headlines make for bad press, on Streetsblog and elsewhere. It’s also never easy or fun to stare down a room with hundreds of angry and desperate yellow-clad protestors and vote to make their lives a little harder. In addition, Metro’s operations budget is not in line with what the Board has demanded it should be. When it passed a Long Range Transportation Plan in 2010, the Board of Directors set a 33% “farebox recover ratio.” That means one-third of the cost of operating buses and trains should be paid by passengers. And so, with a gap in the operating budget and fewer and fewer transit lines left to cut, Metro staff prepared a report on a fare restructuring proposal that appears to fix some of the structural problems with Metro’s flat fare, transition to modern fare collection, create a more equitable system, and increase revenue. Here’s how it would work. Instead of the $1.50 flat fare, Metro moves to a combination of time-based and distance-based fares. A time based fare would allow limitless transfers between Metro lines during a short period of time, say 90 minutes. This will open up Metro for people who don’t use the bus lines because it can be too expensive with multiple transfers. It also makes round trips to locations such as the grocery store less expensive, assuming one can get in and out of the store in a short period of time. Under the proposal, Metro would also add a distance based fare, which would undoubtably make commutes more expensive for the hypothetical North Hollywood resident commuting to Long Beach mentioned earlier. While full figures haven’t been realized yet, it would also likely make my regular commute, from the Westside to Downtown, more expensive as well. Some hope this process will lead to a more fair fare system that has less politics than previous increase debates. “What I hope to see is the start of a process which gradually brings equity between the different fare classes while improving the farebox recovery ratio, without drastic jumps at any given restructuring point,” writes Kymberleigh Richards. Richards currently sits on the San Fernando Valley Service Council and webmaster for the San Fernando Valley Transit Insider. Metro also seems to be learning a lesson about how to role out a restructuring. In the past, the agency would announce a proposal, schedule hearings, and brace themselves for months of angry testimony and aggressive headlines. This time, they’re announcing the outline of a proposal now that will be voted on early next summer. They promise hearings to elicit feedback BEFORE a final proposal, with all the fare details, is announced and more hearings are scheduled. There’s nothing wrong with distance based or time based fares and Metro faces a real operating gap. Whether or not the final proposal earns support or not should depend upon the details. 1. Distance based fare on Metro rail and BRT – you have to tap in AND tap out. Unlimited transfers within the system until you tap out. 2. Time based fare on Metro Rapid and Local bus – just tap in, no need to tap out – you next bus/rail ride is free or discounted (see #4). 3. Free transfers from rail/BRT station to bus within 30 minutes of tap out at a station. 4. Free transfers from bus to rail and from bus to bus within 60 minutes of tap in at the first bus. 5. Inter-agency transfers only allowed with TAP card. No more paper transfers that are basically big fraud scheme. 6. Metro and municipal bus lines needs to come to an agreement on an universal base bus fare. If municipal bus lines still want to get money from transfers to Metro, then they must agree to use TAP card and adopt Metro’s fare structure. What Kym Richards forgets is Title VI and environmental justice issues. The Obama Administration has been much more aggressive at enforcing Title VI, such as with the recent letter that cancelled the December 2011 service change. Generally, seniors have lower average income than the general population. Similarly, the student population is more Hispanic and Black than the general population. Increasing student, senior, and disabled fares dramatically as Richards suggests is a non-starter, based on the outrage from the 2007 fare increase hearing, for which the original Metro proposal followed Richards’ logic and quintupled the senior monthly pass, and sets Metro up for another Title VI showdown. For better or worse, all fares will have to increase proportionally. 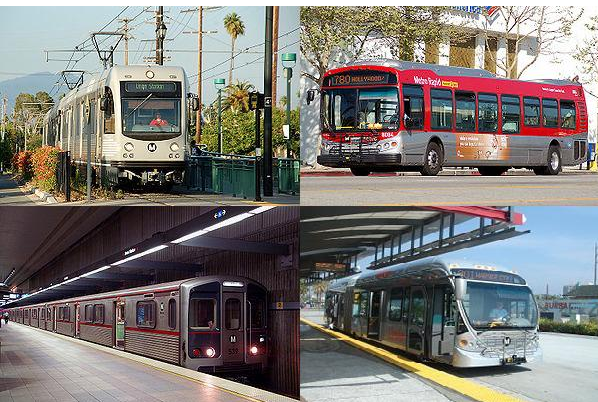 Metrolink accomplished a fare restructuring from the previous zone system through ten years. That is the bare minimum you might need to get to Richards’ goal. “There’s nothing wrong with distance based fares” again presumes that there is no Title VI impact. If a particular racial or disadvantaged group travels longer distances than other groups, and their fare goes higher, that can be considered discrimination. There is a lot of work necessary to disprove that case – not that it can’t be done, but it will take months of effort to meet Title VI. A “fair fare” with day pass, weekly pass, and monthly pass capping would be helpful to cash paying customers, who are disproportionally poor and often cannot scrounge up the amount for a weekly or monthly pass. No it wouldn’t “really be a restructuring” if the stated goal is to increase the farebox recovery ratio, would it? Isn’t that again just an increase couched in the rubric of restructuring? We should be talking about doing away with fares, at the very least for particular groups such as students, not increasing them. If there are particular little pockets of riders that aren’t either transit-dependent or price-sensitive, then it might be worth it to talk about increasing their fares. But I can barely think of any significant group of riders that doesn’t fall into one of those categories. If Metro is really interested primarily in “restructuring” and not “increase”, then why not take increasing the farebox recovery ratio off the table from the start? GIven the positioning and scarcity of TAP card readers at most light rail stations, the idea of forced tap-outs makes me cringe. I’m not sure which light rail stations you use, but I never have trouble finding the TAP readers. “… where short line service will force a transfer, and a new fare, even if you’re traveling in a straight line”. I believe a line continuation transfer can be obtained gratis in such circumstances. But I am not sure if all operators know that. That 33% farebox target was more of a recommendation by staff. To what extent the Board owns it has been unclear. The inability to fully gate the rail system and limitations that likely will delay Metro being able to implement tapping out impacts options for the Board. Did Art Leahy indicate if bringing back Metro to Metro transfers which he appears to be promoting would be in the form of a printed transfer or loaded onto TAP cards? Are they also contemplating transitioning the Metro to Muni transfer to being loaded onto TAP once the munis are all on board with TAP? Bus operators would be thrilled to no longer have to deal with those! DMalcolmCarson, TDA funding by the state requires urban agencies to meet at least a 20% farebox recovery. Metro staff have warned the agency will in time fail to meet that unless fares are restructured. “But I can barely think of any significant group of riders that doesn’t fall into one of those categories” sounds as if you think that the criteria is never, anywhere, anytime as to fare increases. I know at least one activist who asserted to me advocates should always oppose any proposal to increase fares on general principle. That may make one feel good but isn’t very realistic. Just look at the graph in the linked presentation where Metro staff compare base fares of peer agencies to understand why an adament no never stance looks really out of whack. The May 24, 2007 public hearing calwatch mentions was partially about Mayor AV getting spurned by the other Board members to make sure he didn’t get a prize (his tendency to hog the stage bit him that day) and Molina ended up with the trophy of being champion of the underclass with her low base fare approach. Who knows what the Board will do faced with this rather distasteful task and likely limited by Title VI and technology from doing some things they might find appealing like fare capping and distance based. The Board never adopted the principles of the 33% farebox recovery, since they accepted the Molina motion… http://boardarchives.metro.net/Items/2007/05_May/20070524SBMItem1c.pdf If Leahy is arguing he did so as part of the LRTP, it certainly wasn’t made prominent. And Line Continuation Transfers no longer exist. Now, if you had adopted the FY 2012 fares of the Molina motion, simple math tells you would have gotten to 32% farebox recovery. (The FY 2012 fares were $1.80 base fare, $7.25 day pass, $90 monthly pass, with the senior/disabled/student ratios remaining what they are today.) Tweak it to $2 base fare, $7 day pass, and you could probably get to 33%. That is probably a fallback option if they can’t agreement on time based or distance based fares. Also, how much of this was a result of the day pass cut from $6 to $5? The $5 day pass was psychologically a good number. Metro ridership dropped precipitously with the $6 day pass. A 4X multiple for day passes is too high… Maybe a $2 base fare and $6 or $7 day pass sounds better, but not a $1.50 base fare and $6 day pass. Is this a rational process based upon the sort of math outlined? I guess the group dynamic of the Board with several key players approaching the end of their careers and the unknown “Garcetti” factor leaves me unsure where things stand. Too many balls in the air and unknowns for me to hazard a guess where this is all leading. Some sort of change, maybe stumblingly? And of course with the holidays upon us as a practical matter essentially the process now goes into suspended-animation until mid-January. I don’t understand how Metro builds these expensive train and bus stations that are 100% auto-dominated, with vast parking lagoons, with no bathrooms, and no on-site concessions and then (surprisingly) can’t recover enough money to pay for their operations. Ever tried to buy an ad with Metro? Small locally owned companies need not apply. Ever tried to open a concession with Metro? Don’t even bother. Ever tried to go to the bathroom on Metro? Just find a stairwell or elevator. How about a lower bar for bus and train ads? How about some manned pay toilets? How about some mom & pop newsagents and food vendors at stations that can support them? How about making Metro stations human-scale and commerce friendly? How about charging for parking in all those Metro lots? How about re-orienting your stations to the pedestrian and not the motorist? Instead of cutting operations, focus intensely on getting parasitic freeway driving commuters to see transit as viable – cut freeway services! Cut the free towing, cut the office building full of highway engineers. How much “fare box” recovery or sales tax is being generated for Metro through these horrible road widenings and freeway projects? I am willing to bet everything I own that they are worse money losers than nearly every transit project in Metro right now in terms of their “fare box recovery”. I haven’t forgotten Title VI, and I have asked some pointed questions of Metro’s Dan Levy as to how that affects the process of fare restructuring. If you can prove that there is a sound business reason you can make a determination that a disproportionate change is justified; ironically, in the case of the senior fares, you can use the argument that those are creating an inequity to the other fare classes! Also, note that I support a gradual process to bring equity between all the fare classes, without the kind of radical quick-fixes that would cause greater Title VI issues. If it takes ten years, like it did Metrolink (good example), that’s just fine by me. This could be very simple. Eliminate the basic fare, which is only there for advertising purposes. Reduce the day pass to $4 (with appropriately scaled prices for longer term passes). Forget distance-based fares. This system would be simple and would almost certainly bring in a bit more revenue while particularly helping those who are trapped in bus transfer purgatory (i.e., those who are not as well served by their local routes). All transfers are effectively free, without paper or hassle. You must not ride the bus much. A good chunk of riders pay the basic cash fare. I watch them do it (literally) every time I ride, which is almost daily. A $4 day pass, in combination with no basic cash fare, is likely to decrease revenue, not increase it. And it will be inequitable — oh boy, here comes Title VI again — to those who only take a single roundtrip to/from work, or those who ride to work and get a ride home from a co-worker. Simple, yes. “Almost certainly bring in more revenue”, no. If they do distance-based fares, I think something like Portland’s old system would be best. The base fare covers 2 hours in 2 zones, and only the very longest trips (usually from one suburb, through downtown, to another suburb) would fall into the third zone. Or we could do something like their current structure: $2.50 base fare (for 2 hours), $5 day pass. I really don’t want to see a distance-based fare charged on something like an actual per-km basis. They did that in Taiwan a lot and there was basically no way to know, in advance, what your fare would be. Legibility and predictability should be paramount.